Treasures of the Heart: Sweet Tangerine! The kids were all over the church yard eating them, the juice dripping off their chins. Yesterday, in the village, we saw a little girl eating one. She said it came from her house and they were not selling them. We all longed to taste the sweet, new flavor. Later in the afternoon a knock on my door woke me from my afternoon snooze. It was Baptista with two hands full of dark green balls that looked a whole lot like limes to me. Rather proud of himself, he reported, "Oranges!" My friend had climbed the tree on the backside of the property and gathered eight of the most gorgeous, not yet ripe, oranges (or tangerines) you ever want to see. Standing on my veranda, I challenged him. "Are you sure? 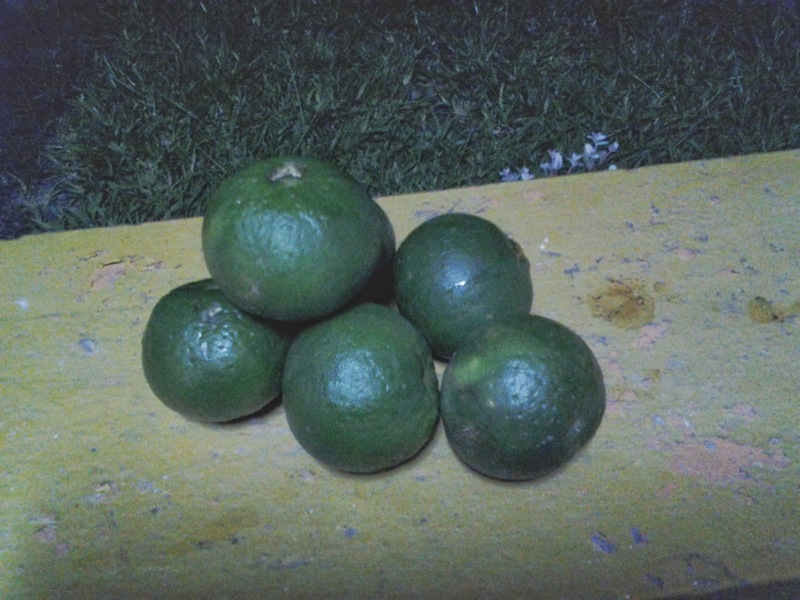 These look like limes." He assured me, "No, dees is sweet. You try it." With some hesitation I peeled one and sure enough, the inside was orange. Still not convinced it was ripe, I took the first bite. The word sweet cannot even begin to describe the explosion of flavor that hit my tongue. "To a hungry man any bitter thing is sweet." The US Military has nothing on shock and awe! The sour burst on my tongue was a liquid that lingered longer than your mouthwash. My friend, in pure innocence, said, "You don' dink is nice?" As I tried to explain that they weren't ripe yet, he was unimpressed with my knowledge and offered a section of his. "Try dis one", he said. The same horrific splash washed through my mouth, they were juicy alright! Once recovered, I told him I was learning the value of the scripture like never before. And shared the verse with him, "To a hungry man, any bitter thing is sweet." He pondered the words as if to put them in perspective. We talked about the kids eating them before they could ripen on the trees because they are so hungry and I told him how sweet they are if they would only let them turn orange. It was a concept he seemed unable to grasp. He had seen a large orange before, but never tasted one like that. Those of us who have never been concerned about where our next meal is coming from can easily think of eating immature fruit as impatient, because we know how good it is when it's ripe. But, to the child that hasn't eaten since sometime yesterday, if he ate then, that sour tangerine somehow satisfies the hunger. Those children knew the beans and rice for lunch were almost ready. But, they have been waiting for the oranges to come into season, and they were so hungry that they simply could not wait any longer. It makes me wonder about those who know they are called to serve the Lord and hunger to do the will of the Father. Jesus said, "I have food you know not of. My food is to do the will of My Father." I can't help but wonder how many hungry people are sitting in the church, willing to eat any bitter thing, if they can only do the will of the Father. They know the beans and rice are there to be eaten, but they want to partake of the fruit that they have been promised. To tell them it's too soon, the fruit isn't ripe, is almost wasted breath. The hunger to do His will often overcomes them and they climb the tree, or find a stick or throw a rock ~ anything to taste the fruit and satisfy the hunger. Others heed the word, maybe the sour taste of the last trip up the tree still lingers on their tongue. Still others wait for the fruit to ripen, and in their wait, weakness sets in. The hunger pangs cease and they lie around, too exhausted to move. Without the bitter fruit, they have no strength to take the sweet fruit. I've been that one so hungry that sour fruit was better than no fruit. I didn't like the taste. It was however, enough to enable me to heed the warning of unripe fruit the next season. But, it is also what sustained me in the wait. The memory of a sour so strong that it caused pain to seize my whole person ~ that, is the bitter fruit that strengthened me in the wait. I understand, on some level, how a hungry man can eat a green tangerine. I've eaten mine. A process I never want to repeat. The fruit that is in season and fully matured is soft and sweet, true enough, but more so, it pleases the senses and satisfies the hunger. May your fruit be ripe and your taste buds delighted! Don't eat a green tangerine!